IT’S a made-to-measure deal that suits a budding snooker star down to the ground. Chandler’s Ford teenager Riccardo Drayton has been appointed a junior ambassador for Savile Row tailoring house Maurice Sedwell. The 13-year-old has achieved phenomenal progress since taking the game up seriously just under two years ago. Drayton, whose highest break in competition is 78, has qualified for the last-16 of the English Under-14 Championship for the second year running. Last season, he and Londoner Ronnie Sullivan became the first players in the nine-year history of the Cuestars Under-21 Tours to earn promotion straight from Bronze to Gold – missing out Silver entirely. Andrew Ramroop OBE – CEO at Maurice Sedwell, whose clients include prime ministers, presidents, Hollywood stars and sporting legends – said: “Our motto is ‘Committed to Excellence’. “And it is Riccardo’s drive and commitment to nothing less than excellence in his game that makes him a natural embodiment of Maurice Sedwell. “Regardless of age, if you care about how you present yourself, you care about what you are offering others whether that be in business, sport or any other field. “Riccardo takes his training and sport very seriously and clearly means business. It is for this reason that we would like to see him dressed in the very best. 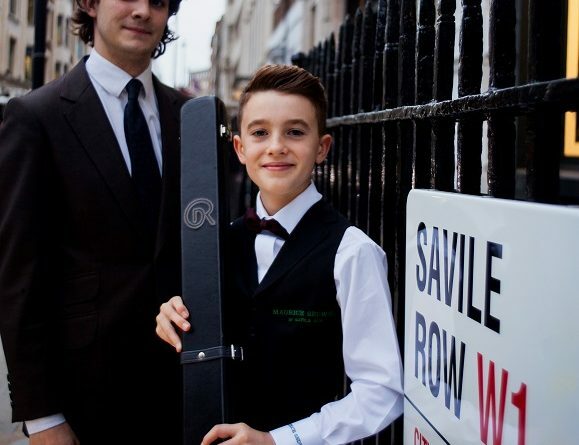 Drayton said: “I want to say a big thank you to Daniel, Roger, Judith and all the rest of the Maurice Sedwell team for doing such a phenomenal job on my two customised outfits. Picture supplied by Maurice Sedwell Ltd.
Maurice Sedwell director Daniel Haworth and Riccardo Drayton.